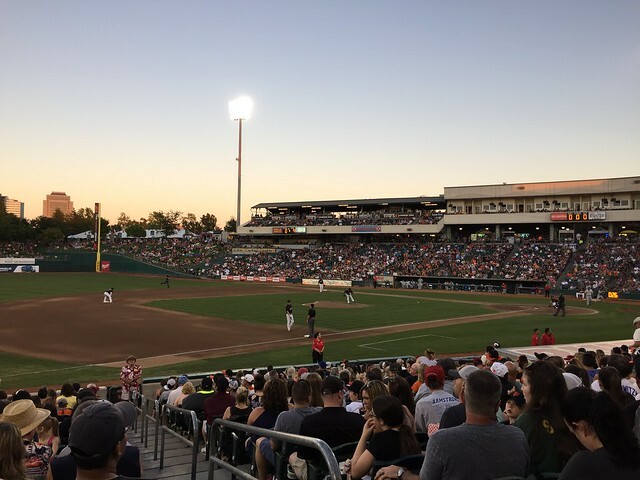 The best offense in the Pacific Coast League took the field Saturday night and then looked on as the Sacramento River Cats (45-56) ran up the score early en route to a 12-0 win over the El Paso Chihuahuas (57-42). Sacramento struck for nine runs in the first two innings and coasted to the win behind an excellent combination effort from the bullpen. Sharon, Jack, Kiki and I went to the Sacramento River Cats versus El Paso Chihuahuas Pacific Coast League baseball game. As a social event for her work, Sharon's company took more than 100 people to the game. We had dinner in the Smokehouse BBQ area before wandering to the seats. I was excited to see Hunter Pence in right field. The two-time World Champ and two-time All-Star was working his way back from hamstring surgery. Pence went 1-for-4 with a double in six innings. Kelby Tomlinson played third. He was 3-for-5 with two runs scored. We stayed for the fireworks after the game. Unlike the experience in Lille, it was fairly easy to get out of the parking lot after the game!